Whether you are a Retail, Mail Order/Home Delivery, or Specialty Pharmacy, our systems can meet all of your unique dispensing needs. With new features and hundreds of integrations, we are building software systems for every pharmacy business model. Our in-house support team works hard to develop a deep understanding of how GuardianRx™ systems relate to individual pharmacy business needs. At CarePoint, we are persistently looking toward the future. With the input of pharmacists and pharmacy technicians, our GuardianRx™ systems remain at the cutting edge in the industry. 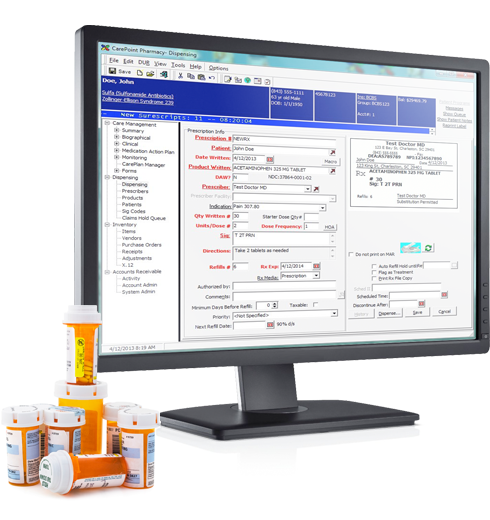 Tracked and reconciled at the Rx level, with GuardianRx™ you have the ability to import 835/Electronic EOB files or create manual reconciliation batches. Whether it is a refill reminder, prescription pick-up notification, or a birthday message, you can instantly and automatically communicate with your customers. With easily configurable, state required settings, you can schedule reporting for automatic transmission to states. CarePoint offers a complete perpetual inventory package which includes inventory tracking, purchase order generation, and X12 EDI integration with all major wholesalers. Integrated with our dispensing system, you can perform comprehensive medication reviews for disease state management eligible for 3rd party reimbursements. Our GuardianRx™ systems provide a fully integrated dispensing module that handles real-time 3rd party claims adjudication, updated drug utilization reviews, and more. Fill out the form below and tell us a little about your pharmacy!